Although avoidance is necessary to minimize the risk of exposure to an antigen, it is difficult to accomplish in day-to-day life, and severe reactions frequently occur despite significant efforts.11 Several challenges must be overcome to achieve effective avoidance, including understanding food labels, overcoming embarrassment (adults) and potential bullying (children) in social situations, failing to recognize actual risk, and preventing cross-contamination in the home. 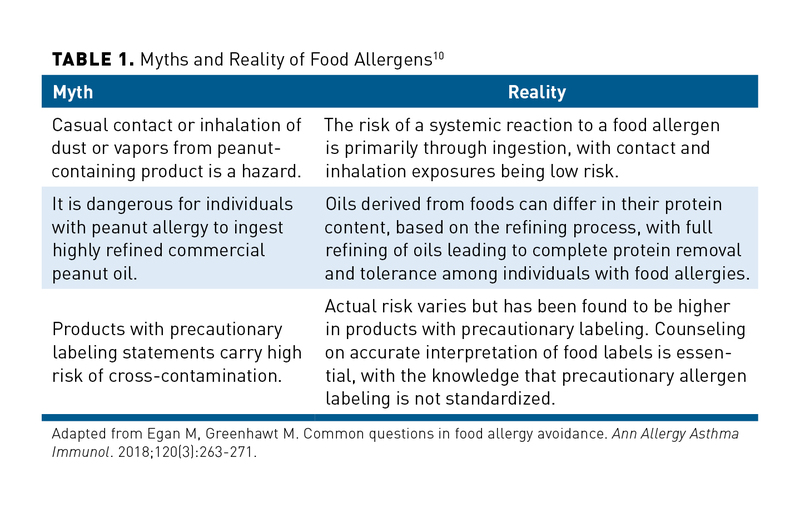 These issues should routinely be addressed in clinical practice with patients who have peanut allergy, and with their families. For adults, the dosage of epinephrine for anaphylaxis is 0.2 to 0.5 mg (0.2 to 0.5 mL of 1 mg/mL solution) intramuscularly (IM) or subcutaneously (SC) every 5 minutes as needed.16 For IV administration, the dose is 1 mg (1 mL of 1 mg/mL solution) in 250 mL of dextrose sodium chloride (4 mcg/mL) infused at 1 mcg/min (15 mL/h) or 1 mg in 100 mL of normal saline (10 mcg/mL) infused at 5 to 15 mcg/min (30 to 100 mL/h).16 In children, the dose is 0.01 mg/kg (0.01 mL/kg of 1 mg/mL solution) or 0.3 mg/m2 SC to a maximum dose of 0.5 mL, which can be repeated every 4 hours if required.16 Epinephrine autoinjectors are available in 0.1-, 0.15-, and 0.3-mg doses and may be injected SC or IM; doses may be repeated if severe anaphylaxis persists.16 This is a summary of dosages, and full dosing guidelines should be reviewed for complete recommendations. There are a number of therapies currently under investigation for desensitization of peanut protein. To best understand the clinical data regarding the safety and efficacy of these agents, knowledge of best practice guidelines and common terminology is essential. 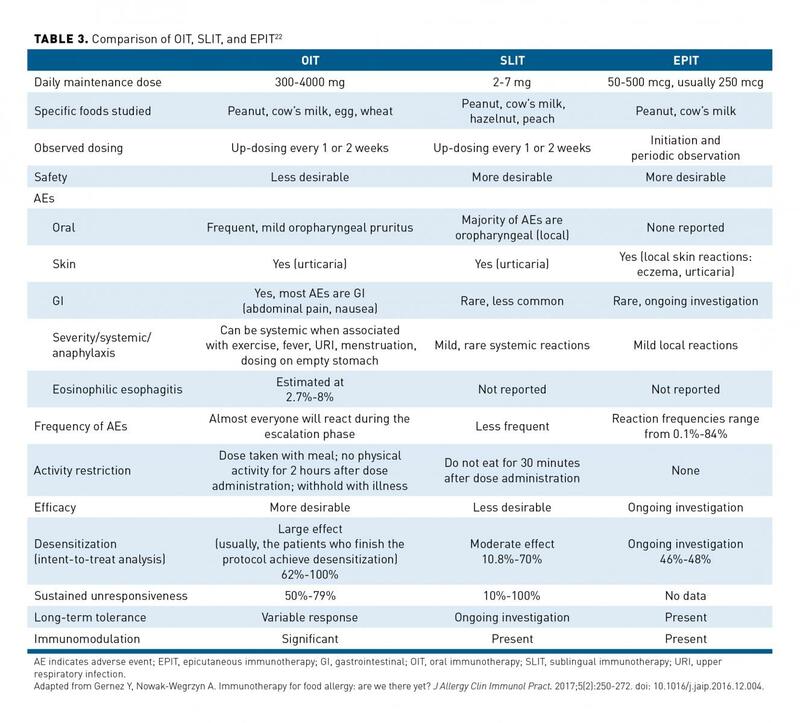 These standards are summarized below, followed by an overview of the agents currently undergoing development for use in patients with peanut allergy. When evaluating clinical trials involving patients with peanut allergy, managed care professionals should be aware of study design methodology and outcome definitions. Published in 2012 by the American Academy of Allergy, Asthma & Immunology (AAAAI) and European Academy of Allergy and Clinical Immunology (EAACI), the PRACTALL guidelines provide standardized recommendations for the performance of double-blind, placebo-controlled food challenges (DBPCFCs), which are considered the gold standard.18 Although some trials have successfully incorporated DBPCFCs into their methods, others have not, and recognition of these differences is important to interpreting outcomes. The PRACTALL guidelines recommend escalating food protein doses in set amounts beginning at 1 mg and escalating up to 3000 mg (ie, 1, 3, 10, 30, 100, 300, 1000, and 3000 mg) or until a reaction occurs.18 For scale to real-world dosages, a single peanut kernel contains approximately 250 to 300 mg of peanut protein, and a peanut pod contains 2 kernels.19 Because clinical trial designs vary, understanding the definitions of each outcome that may be reported is important for comparing efficacy data between trials. 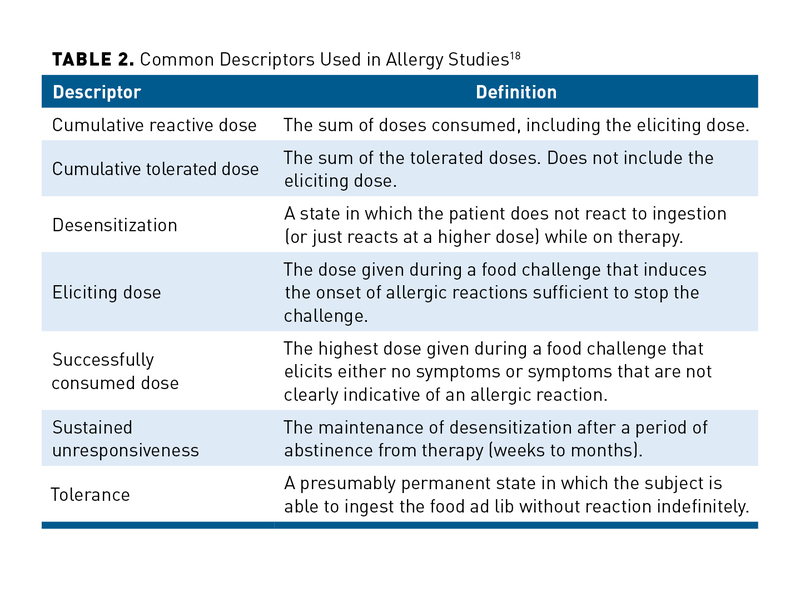 Managed care professionals should be aware of common descriptors used throughout allergy studies, as defined in Table 2.18 For example, if a trial participant experiences an objective reaction at 100 mg, that would be referred to as the eliciting dose.18 The cumulative tolerated dose would be 44 mg, the successfully consumed dose would be 30 mg, and the cumulative reactive dose would be 144 mg.18 Awareness of these definitions is important because Trial 1 may report a cumulative reactive dose of 144 mg, whereas Trial 2 may report a cumulative tolerated dose of 44 mg; without awareness of definitions, the reader could interpret Trial 1 as being more effective than Trial 2, when, in reality, the trials are reporting the same outcome. Several new therapies are undergoing clinical development for use in patients with peanut allergy, and managed care professionals should be knowledgeable about the safety and efficacy of these agents. Although the mechanisms of action of clinical immune tolerance are not completely understood, several theories have been presented in the literature. As summarized by Syed et al, these mechanisms may include increases in allergen-specific blocking immunoglobulin G antibodies, a shift from a T helper type 2 response toward a T helper type 1 response with increased IFN-γ production, reduction in specific immunoglobulin E, reduced recruitment of or increased anergy/deletion of T effector cells, and induction of regulatory T cells.20 Novel immunotherapeutic options undergoing development differ by routes of administration and include oral immunotherapy (OIT), epicutaneous immunotherapy (EPIT), and sublingual immunotherapy (SLIT). Additionally, some biologic agents already approved for use in other diseases are also being explored. The most recent safety and efficacy data on these agents are summarized below. Three phase 3 trials of AR101 are currently ongoing or have been recently completed. The PALISADE trial enrolled 551 participants aged 4 to 49 years in the United States, Canada, and Europe.30 The inclusion criteria limited enrollment to patients who reacted to less than 100 mg of peanut protein during the screening DBPCFC; once enrolled, participants were randomized in a 3:1 ratio to receive AR101 or placebo. The primary efficacy end point was the proportion of participants aged 4 to 17 years tolerating a single highest dose of 600 mg of peanut protein, which equates to a cumulative tolerated dose of 1043 mg.
Like OIT, EPIT works by exposing the patient to peanut protein in order to induce desensitization. However, unlike OIT, EPIT is delivered through skin contact via an epidermal patch. Notably, use of EPIT on intact skin does not introduce the allergen into the bloodstream; instead, the intact skin exposure allows allergen uptake by Langerhans cells in the epidermis, which subsequently induce regulatory T cells in regional lymph nodes, leading to downregulation of Th2 responses.34,35 This contrasts with peanut exposure through inflamed, eczematous skin in patients with atopic dermatitis, which is believed to lead to allergic sensitization. 12 months of daily patch applications.38 The primary efficacy end point of treatment response was defined as 10-fold or greater increase in eliciting dose and/or reaching 1000 mg or greater of peanut protein.38 By study completion, a significant difference in response rates was seen with the VP250 group versus placebo (absolute difference, 25%; 95% CI, 7.7%-42.3%; P = .01); however, there was no significant difference found between the VP100 and placebo groups. The proportion of patients in the VP250 and placebo groups with an eliciting dose of 1000 mg or greater after 12 months were 32.1% and 12.5%, respectively.38 In both the Jones et al and Sampson et al trials, the efficacy of Viaskin Peanut was greatest in younger subjects (aged 4-11 years in Jones et al; aged 6-11 years in Sampson et al). Therefore, all subsequent studies have enrolled younger subjects. A recent analysis estimated that increasing the threshold of reactivity to peanut from a baseline of 100 mg or less to 300 mg would reduce the risk of accidental reactions caused by contaminated foods (most often cookies, ice cream, and snack chip mixes) by more than 95%.47 Narisety et al compared SLIT with OIT in 16 participants aged 7 to 13 years.48 Doses were escalated to 3.7 mg/day (SLIT) or 2000 mg/day (OIT), and DBPCFCs were conducted at 6 and 12 months of therapy. After 12 months, all participants had a 10-fold increase in challenge threshold; however, the threshold was significantly higher among participants receiving OIT compared with those receiving SLIT (141-fold vs 22-fold; P = .01).48 AEs were also more common with OIT compared with SLIT (43% vs 9% of doses; P <.001), with 5 doses of epinephrine required to treat systemic reactions in 4 subjects receiving OIT.48 The main takeaway from these trials is that SLIT is effective at inducing desensitization, albeit not as effective, but with fewer AEs compared with OIT. Despite being more efficacious, OIT has demonstrated concerning rates of AEs in clinical trials. Virkud et al pooled data from 3 OIT studies involving 104 children with peanut allergy to evaluate safety outcomes and identify potential baseline predictors of higher rates of AEs.29 Researchers found that 80% of participants experienced likely related AEs during OIT, with 42% experiencing systemic reactions and 49% experiencing GI symptoms.29 Baseline allergic rhinitis (incidence rate ratio [IRR]: 2.85; 95% CI, 1.61-5.04; P <.001), asthma (maintenance phase only, IRR: 2.30; 95% CI, 1.08-4.88; P = .03), and peanut skin-prick test (IRR: 1.38; 95% CI, 1.10-1.72; P = .005) significantly predicted higher rates of AEs.31 Eosinophilic esophagitis is estimated to occur in about 2.7% to 5% of patients undergoing OIT.50,51 Currently, both AR101 and Viaskin Peanut are in the process of submitting BLAs to the FDA. The relative pros and cons of each treatment will need to be weighed when choosing which therapy is most appropriate for an individual patient. For example, for a child with a history of eosinophilic esophagitis or chronic abdominal symptoms, the clinician may need to take into consideration the safety data of AR101. For other patients, the relative increased efficacy of AR101 may outweigh the higher rate of AEs. Treatment for peanut allergy relies heavily on avoidance and prompt administration of epinephrine if and when anaphylaxis occurs. 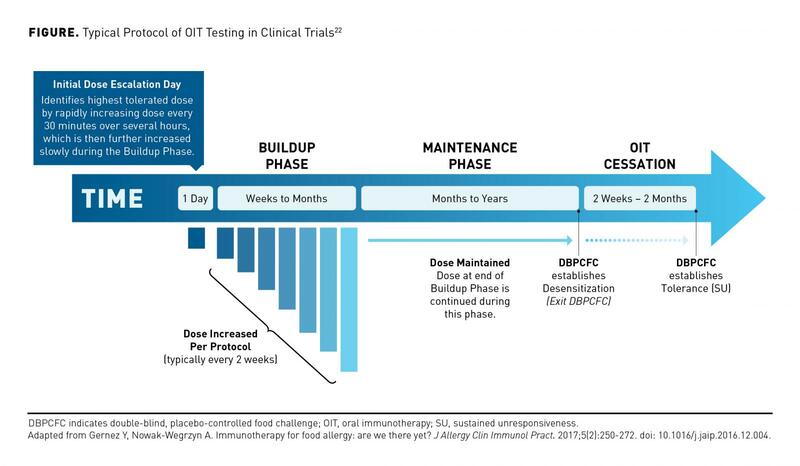 To address the need for better therapies that can aid in improving long-term outcomes, several novel immunotherapies (OIT, EPIT, SLIT, and monoclonal antibodies) are undergoing clinical evaluation for children and adults with peanut allergy. Comparatively, OIT appears to offer the greatest advantages in efficacy regarding induced desensitization; however, OIT also presents the highest rates of AEs. It is also important to recognize that the treatments under investigation aim to protect from accidental ingestion leading to allergic reactions, not to allow full reintroduction of peanut into the diet. Understanding the PRACTALL guidelines and outcome definitions is critical in comparing results between trials, and managed care professionals must be prepared to translate these results into clinical practice and future pharmacy benefit decision making.